Probably the most anticipated episode this season for a variety of reasons, "Abyss" does not disappoint. Beautifully written by executive producer Brad Wright, the visually striking "Abyss" delves into the psyche of Jack O'Neill as he is repeatedly tortured to death and revived with a Goa'uld sarcophagus. Strong performances are logged by all of the actors throughout "Abyss," but especially by Richard Dean Anderson, who glows in this episode. Anderson's portrayal of Jack is mesmerizing as he layers frustration over desperation over desolation while at the same time holding on to Jack's sense of honor and duty and, above all else, his overwhelming loyalty to those he cares for regardless of consequence. The scenes between O'Neill and Daniel Jackson, reprised by Michael Shanks, seem surreal. Until the end, you're still never really sure that Daniel is Daniel and not some figment of Jack's imagination, or a Goa'uld trick. It isn't until Daniel returns from eavesdropping at the S.G.C. that I was certain who we'd seen is actually the ascended Dr. Jackson and not some chimera. Martin Wood directs "Abyss," and does so with great artistry. From Jack's drop from the "gravity" rack into a black pit and appear to land on the floor of his cell to the paradox of a woman sitting on the floor that is Jack's ceiling, the episode looks like it's pulled from an M.C. Escher drawing. The musical score chosen of simple piano music is especially poignant, adding to Jack's feeling of despair and isolation. Though Daniel's been there with him, it's clear that the ascended friend doesn't understand completely what motivates Jack. That separation is evident through the haunting music backing their scenes, as well as through the blocking between the actors. Even at the end of the episode, the score continues, carrying through the feeling that Jack has been affected more than anyone will ever know. However, when Sam reenters the infirmary the theme finally does fade to a more familiar, hopeful melody (similar to one heard at the end of "Entity"). There is a very gothic look to the set, complete with stained glass above Baal's dais and a wrought-iron gravity gate on which Jack was tortured -- similar in design to a "rose" window common in medieval cathedral architecture. Baal seems positively Machiavellian in both character and costume, with his black jacquard waistcoat with ruffled sleeves, which lends to the macabre feeling of the episode. The visual effects for this episode are also a wonder to see. Jack being drawn magnetically to the gravity gate, the daggers dragged by gravity to impale Jack, the acid falling horizontally, the shifting of the center of gravity within Jack's cell -- all are amazing to watch and so seamlessly blended that the effect is entirely believable. Jack's torture loops mimic the time loops from "Window of Opportunity," in some twisted way, with the repeated flashes of light and focusing in on Jack at the beginning of his scenes. Even with the last flash, you're not sure if Jack truly escaped or if the torture is about to begin again. Brad Wright does a remarkable job with the dialogue in "Abyss," which crackles from start to finish. 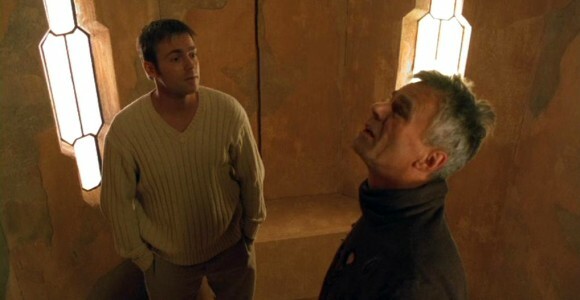 Scenes between Hammond, Counselor Thoran and SG-1 are just as heated as those between Jack and Daniel. Wright also heightens the tensions between the S.G.C. and the Tok'ra with the tug of war over information that could lead to the rescue of O'Neill. Problems with the episode are few, but those that exist are nagging. Why does Daniel disappear for such a great deal of time? Heck, why did he show to begin with if he wasn't going to help in any way? He didn't come in with the expressed intent to ask Jack to ascend; he only offered that later when he realized that no one knew Jack was imprisoned by Baal. As much as I enjoyed Michael Shanks' reprisal of Daniel, I am perplexed, as the only reason he seems to be in the episode is to eavesdrop on the S.G.C. so Jack can be warned when it is time to escape. Daniel's presence may have offered a small comfort to Jack, but it equally unnerved and irritated Jack because of Daniel's unwillingness to bend the rules for a friend. Questions for this episode still remain. Was Jack forced to leave the Tok'ra by Kanan or was he a partner in the rescue attempt of the slave girl? How did Jack actually escape? Will there be repercussions from Jack's experiences in future episodes? And, what will be the temperature of future contacts between the S.G.C. and the Tok'ra, or with System Lord Yu, for that matter? "Abyss" is a very powerful look into who Jack O'Neill is and what he's made of. While the on-screen torture of Jack shown is less intense than what Teal'c suffered through in "The Serpent's Venom," what is left to the viewer's imagination is more than sufficient to get the point across: that the potential damage to Jack's psyche, like the actual brutality of the torture we didn't see, is unfathomable. Poignant and bittersweet, "Abyss" is visionary, both in characterization and in execution, an episode that microcosms relationships between friends and enemies and how indiscernible the line can be between the two. VOTE! How would you rate SG-1's "Abyss?"